There are still a few time slots available and if you haven't already selected a time, please do so by email or outside the classroom. 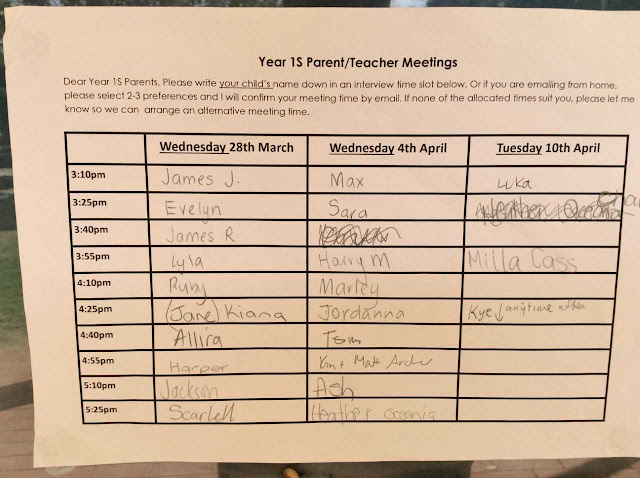 Please take this timetable as confirmation of your meeting time. Meetings begin from tomorrow afternoon. After the children's beautiful Holy Week performance today, we can start to focus more on our upcoming Year 1S Prayer Assembly (next Friday 6th April). Many thanks to all of your efforts with helping the children practise their reading parts at home, as well as preparing costumes for today's Holy Week performance of The Last Supper. With the long weekend coming up, we will have limited time to work on reading parts and singing at for our Prayer Assembly, so any help from home will be greatly appreciated. I have introduced the children to a song that we will sing and a link to the song is below if you have some time to play it on repeat for your kids (perhaps over the long weekend)! I have sent home short reading parts in the children's homework folders today. Every child has a small part to read. There will be no costumes for this Prayer Assembly.